Boyds Mills Press, 9781590789551, 32pp. Niko may live on boring old Earth with his family, but he's always finding a new adventure. Using the spaceship that he built from a box in his backyard and a little imagination, he flies off into space with his robot, Radar, and his dog, Tag. The only one NOT invited is his sister Posh who keeps trying to insert herself into Niko's story. In this first mission, Niko and crew (and maybe also pesky Posh) fly to the moon in search of a lost cat. 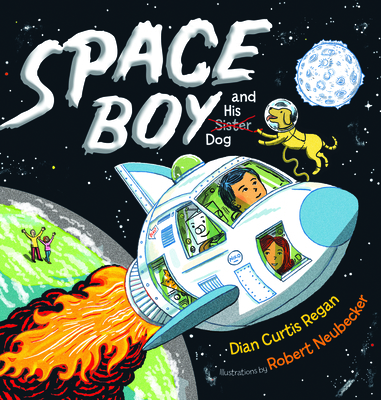 Illustrated in comic–book style and featuring easy–to–read text packed with humor, Space Boy and His Dog is Niko's first adventure, with two more books planned in the series. Dian Curtis Regan is the author of the bestselling PRINCESS NEVERMORE and many books for young readers, ranging from picture books to young adult novels. Her books have received many honors, including Best Books for Young Adults and Children's Choice Awards citations. Robert Neubecker is the award-winning author-illustrator of WOW! CITY! ; WOW! AMERICA! ; and WOW! SCHOOL!, and the illustrator of THE PROBLEM WITH NOT BEING SCARED OF MONSTERS and its upcoming sequel THE PROBLEM WITH NOT BEING SCARED OF KIDS. He lives in Park City, Utah.